Life in Luanda has been quite hectic lately, hence the delay since my last blog. 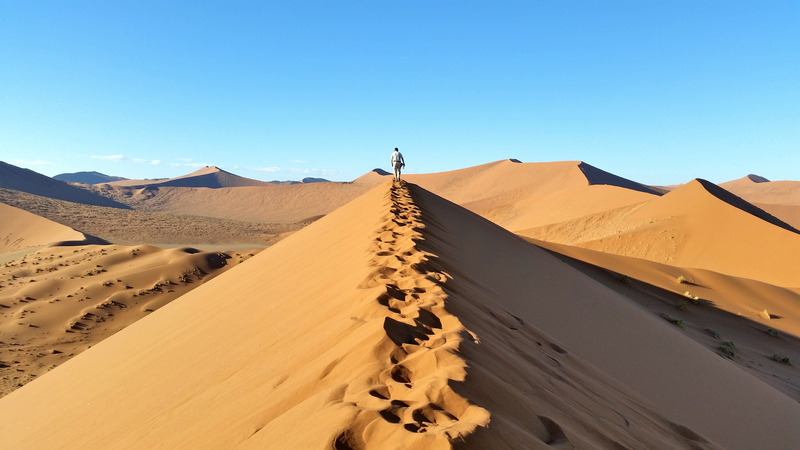 Thankfully, the memories of our climb of Dune 45 in Sossusvlei, Namibia are still fresh in my mind. 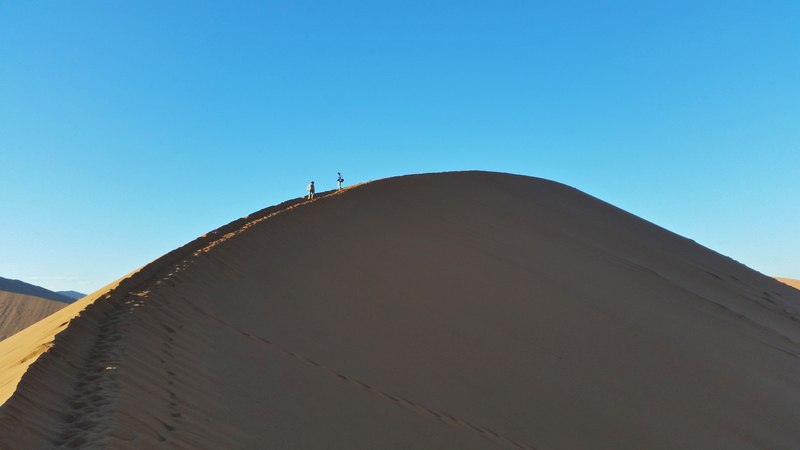 For weeks before our trip, my husband had me climbing stairs and cranking up the incline on the treadmill in preparation for our assault on the mythical dune. I had no idea what to expect, but made sure I could easily climb forty-five flights of stairs, just in case. Something about that number just seemed right. By the way, forty-five flights is three times from the bottom to the top of our building, in a boiling hot stairwell that smells of oil and garbage. Sound fun? The things I do to for that man. The morning after our beautiful balloon ride over the dunes, we gathered in the lodge to head to the entrance of Sossusvlei Park. A British couple came along with us, and we bonded instantly. They were quite friendly and appeared to be about our age, which was particularly important to me. You see, I hoped this meant they wouldn’t be running up the dune and leaving us, or rather me, in their dust. I hate being humiliated, especially on vacation. We made it inside the park just in time to see the sun’s rays spread across the valley. While we were stopped at an overlook, soaking up the magnificent view, cars sped past us in an attempt to be first on the dunes. I’ve long since given up the need to first at anything. We enjoyed the sunrise and then leisurely made our way to the base of Dune 45, so named because it is forty five kilometers from the park entrance. A popular stop for visitors, it is easily accessible while most of the dunes are not. We guessed many of the cars were also headed to other dunes, specifically the one named “Big Daddy”, which is the tallest accessible dune in the park. Again, I’ve long since given up the need to climb the tallest anything. Dune 45 was just fine with me. Thankfully, it was still fairly cool when we began our ascent, though the sun was coming up fast. The startling red-orange sand was in brilliant contrast to the deep blue, cloudless sky. It was hard to focus on our climb rather than the beautiful surroundings! On of the hills to climb on Dune 45. Not the top yet, but getting closer! Climbing in sand is always a challenge, but especially so when the sand is bone dry and piled hundreds of feet high to a sharp peak. Surprisingly, the best place to walk is right along this peak, placing one’s feet in existing footsteps as this sand is slightly more stable. Oh, the things I have learned on this crazy journey! Walking along the spine of Dune 45. As we climbed, I focused on each of my husband’s footsteps, rather than the steep drop-offs on either side or the long trek ahead. Before I knew it, we came upon our British friends. She had plopped herself down in the middle of the path and refused to take another step. It was not the physical effort that stopped her, but rather her extreme fear of heights. Her husband seemed unsure whether to keep going or stay with his wife. In the end, he came along with us, and she seemed perfectly happy to stay where she was. Up and up we went. It took some effort, but the view from the top was worth every step! View from the top of Dune 45. From the crest of the dune, we could see that it went on for quite a distance. Since we had already done the hard part, we were happy to keep going. Our friend, however, headed back down to his wife. Wise choice, fella! We walked on for awhile longer, but knew our British friends and guide were waiting for us back at the car. Reluctantly, we turned around and headed back down. The day was only going to get hotter after all, and we had more to see. The climb up had been much easier than I expected, and the trek down was just plain fun! Imagine those moving walkways at the airport – feeling superhuman as you speed past the poor saps walking along the old-fashioned way. This was the same sensation, only with the benefit of gravity. Down we went, faster and faster, finally breaking into a jog. Each step a leap followed by a soft landing in the sand. About halfway down, I stopped to remove my shoes, which were so full of sand there was barely room for my toes. What a wonderful feeling it was, effortlessly running down that bright orange sand, so cool on my feet! Truly, I would have climbed back up just to be able to run down again! Once we reached the bottom, we saw a group of people dragging thin “sand boards” up the dune with them. I would have loved to see them fly down the dune on those boards, but we needed to press on. 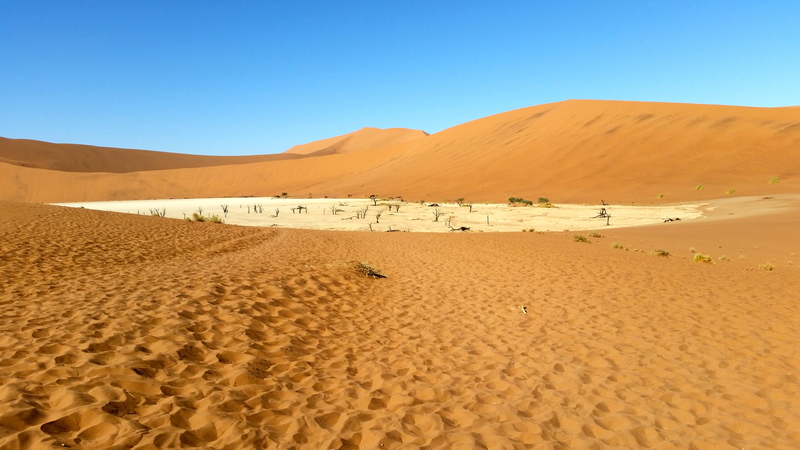 Our next stop was the Dead Vlei, or dead lake, an area where hundreds of years ago an ancient river flowed during occasional rains, and camel thorn trees grew as a result. In Namibia, the terms “river” or “lake”, are used to describe any spot where water has once been or where the aquifer is close enough to the surface to support plant life. There are no true rivers or lakes anywhere in Namibia, except along its borders. There is, however, a vast system of underground rivers which are easily identified by a line of trees or bushes. These aquifers are of little help to the animal life, of course, but for people who are capable of digging a well, it means the ability to live and farm in a mostly uninhabitable country. 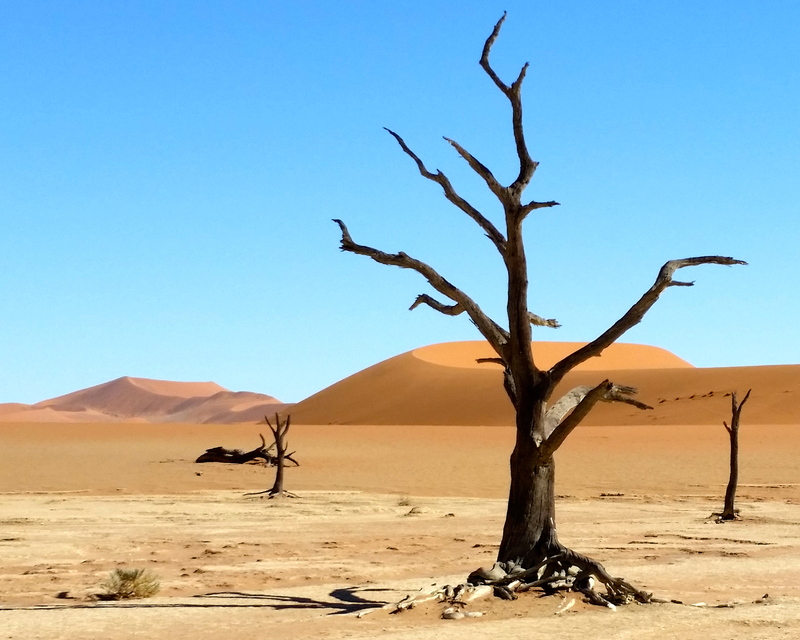 In the Dead Vlei, climate change and shifting dunes cut off the water source and the trees died. Their petrified trunks remain, some up to 900 years old. 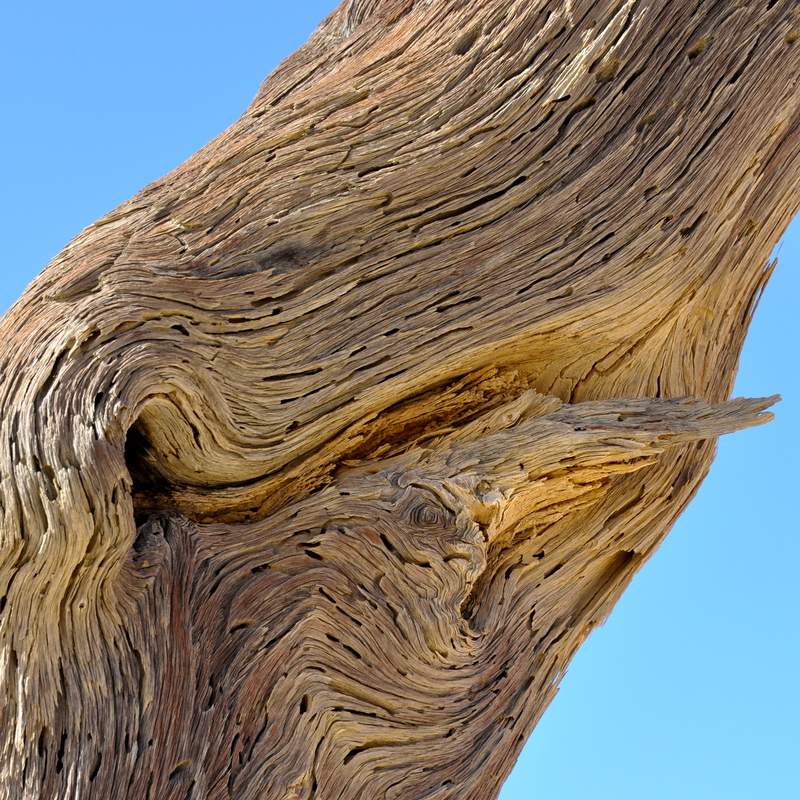 Each tree is a work of art, forever preserved in this dry desert climate. 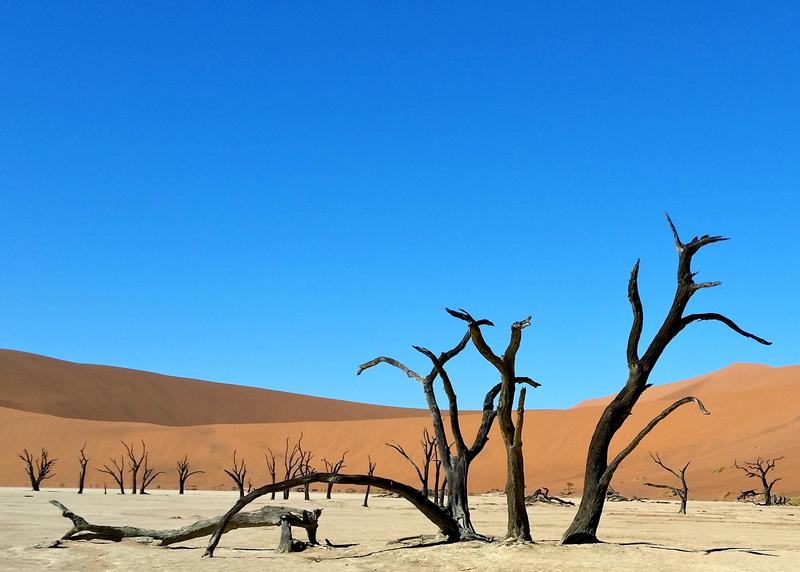 Dead Vlei trees – 900 year old works of art. The Dead Vlei and its beautiful ancient trees. Close up of a camel thorn tree in the Dead Vlei. After hiking around the Dead Vlei and taking way too many photos of dead trees, the sun was beginning to take its toll. The shade of our car was most welcome, as was taking off our boots and pouring out a pile of sand from each one. We drove a little further into the park until we found a rare shady spot to have lunch, which our guide had brought along with him. He also offered us hot coffee or tea, which we politely declined. He explained that Namibians (and people from India, apparently) always drink hot beverages when it is even hotter outside. He claimed the hot liquid somehow makes the body feel cooler. The Brits agreed, and sipped on a cup of hot tea, while sweating profusely. What a load of hooey! We stuck to our ice cold sodas instead. Our mothers didn’t raise fools, you know. After lunch, we headed back to the lodge for a siesta and a dip in our ice-cold plunge pool. By ice-cold, I mean literally as cold as a bucket of ice. How a pool could be so cold in such dreadfully hot weather, I will never understand. I know, I know, evaporative cooling and all that. Still, it was so cold that it was actually painful – but very refreshing, according to my husband. I wasn’t about to get in. I’ve blogged before about my aversion to cold water. But I did dip my feet in – ever so slowly – and that cooled me off quick enough. The afternoon activity was four-wheeling through the desert valley. This was much more fun that I expected, and the scenery was spectacular. Our guide rode in front to keep the speed demons in check (i.e. my husband), so we had ample opportunity to look around and take in the immense valley from the perspective of the oryx, springboks, and ostriches that live there. A thunderstorm in the desert. 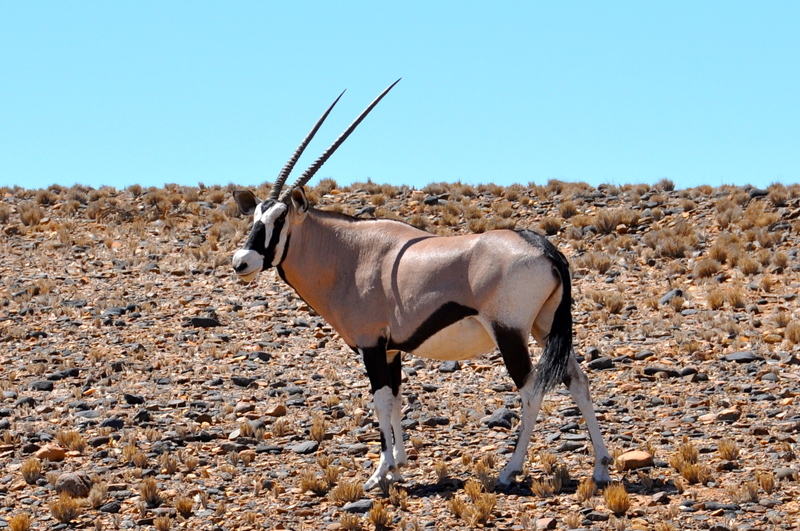 A beautiful oryx in the Namib desert. The animals in this area live with little to no water at all, subsisting on whatever small amount is found in the plants and grasses they eat. Truly amazing! 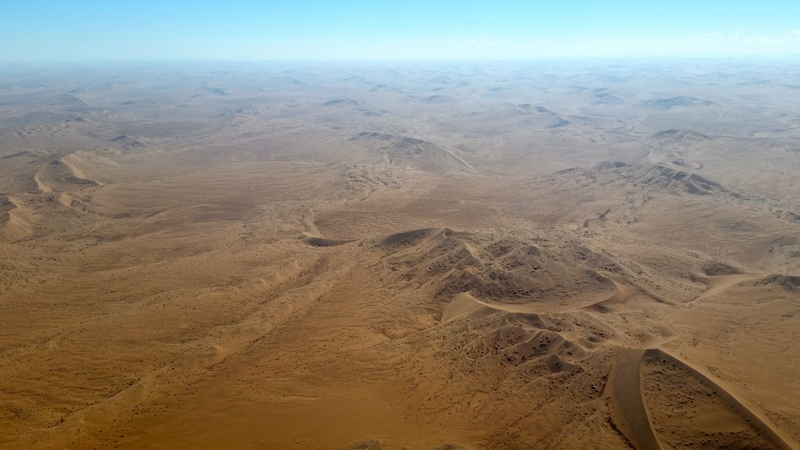 A panoramic view of the colorful Namib Desert. Our evening meal was served a short walk away from the lodge, under a small grove of trees. This “Boma” dinner turned out to be the most fun of all of our meals on the trip. Our guide walked us out to the Boma in the pitch dark with the aid of a small flashlight. 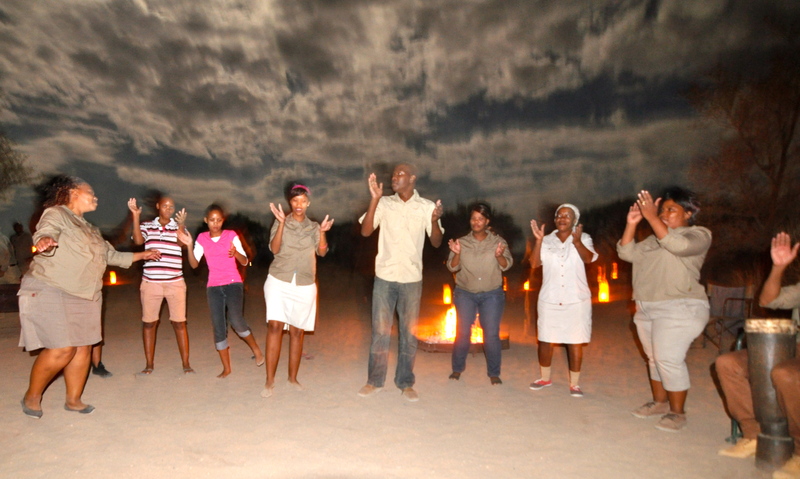 As we approached, we could hear the staff of about fifteen singing African songs with gusto. They welcomed each of us with a cocktail, and then one lady stood up to welcome us in the local bush language, a mixture of words and clicks. So fascinating to hear! Here is a link to a You Tube video about this language. The first twenty seconds or so is about our gluteus maximus muscles, but be patient and it will transition to the subject at hand, I promise! After more singing and dancing, a buffet dinner was served with plenty of local favorites and game meats on the menu. The oryx and kudu that we tried were tastier than the best Texas beef, and even more tender! Towards the end of the meal, two animals raced through the Boma, one chasing the other. In the dark it was hard to tell what they were, but both were larger than a fox and clearly feline. They turned out to be African Wildcats, which are slightly larger than a domestic cat. Not exactly threatening to humans, but startling nonetheless. 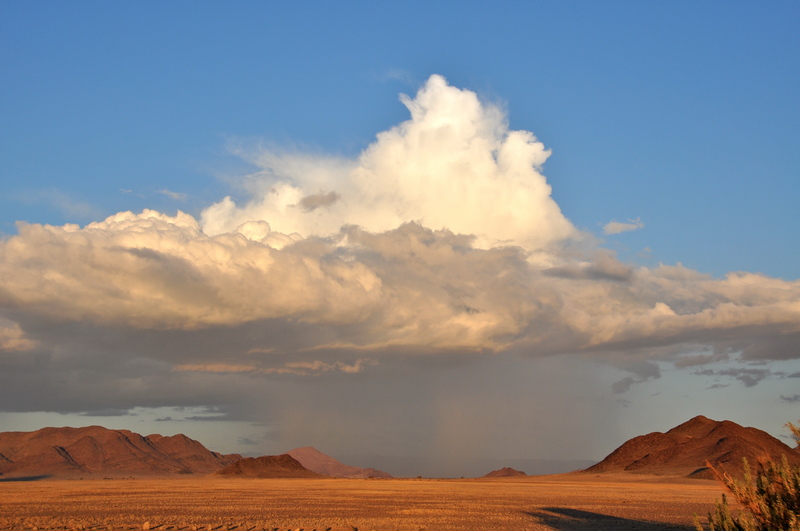 The next morning, it was time to leave Sossusvlei and head to the coastal town of Walvis Bay. This meant another tiny plane and a scenic flight over the desert. We arrived at the dirt airstrip to find that the airport we were due to fly into was fogged in, a common occurrence. 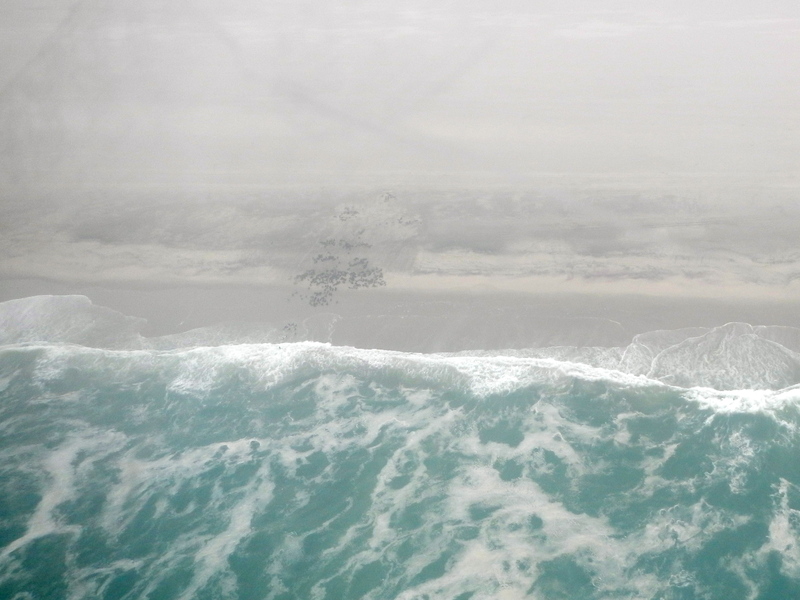 Along the Namibian coastline, the cold Benguela current comes very close to shore. Where the cold water meets the hot desert air, thick fog forms and creates havoc for pilots and ship’s captains. After an hour or so delay, the fog had lifted and we were given the green light to board. Something is not right when your car is bigger than your airplane! This plane was slightly larger than the one which had brought us there, thank goodness! This plane had room for the pilot, our British friends and us. 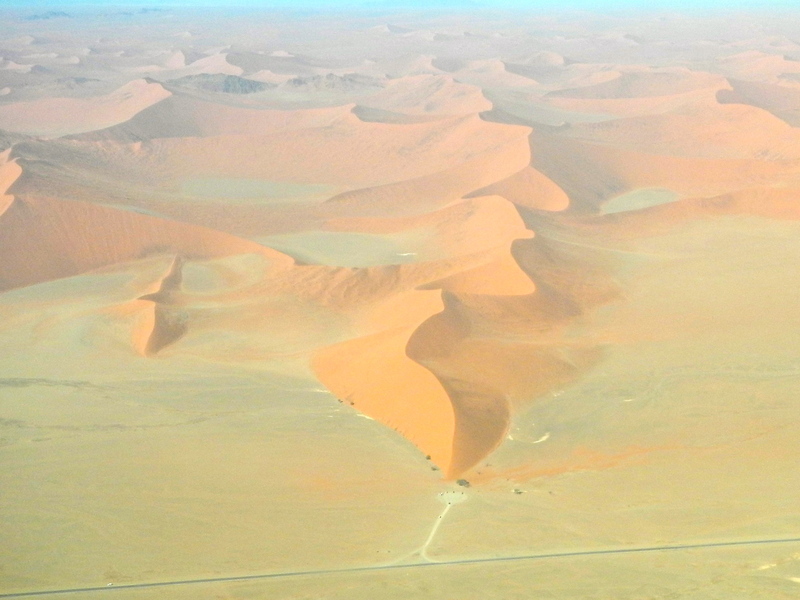 The flight took us over the dunes, with a great view of Dune 45, and then on to a whole lot of nothing. No people, no water, no trees, no shade – just miles and miles of sand and rocks. It was hard not to imagine what would happen if our plane went down. Later we learned that all of us were thinking the same thing, but no one had dared say it out loud! We laughed when our friends said they felt safe because my husband, the great white hunter and fisherman, was along on the trip. Somehow they thought these skills would come in handy, even in an area with no animals to hunt or fish to catch. I suppose to city folk, a guy who has slept outdoors and killed his own dinner must have seemed like Bear Grylls! 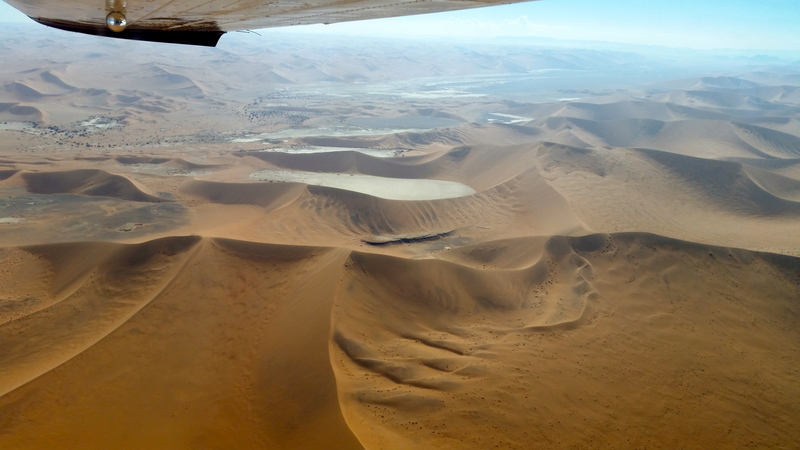 A great view of Dune 45 in Sossusvlei, Namibia. 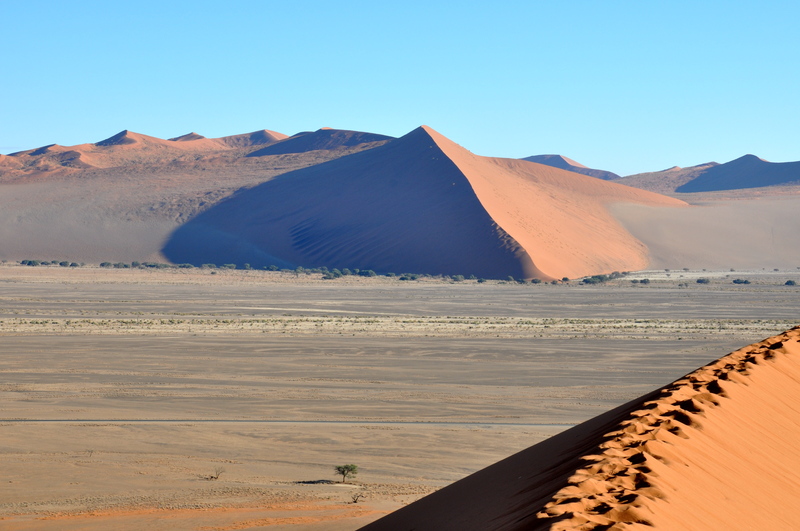 Sossusvlei – Red sand dunes as far as the eye can see. The red dunes gave way to a slightly rockier landscape, but still no water or shade in sight. After more than an hour of this desolate landscape, we came upon the coastline and saw large groups of seals gathered on the beach. We flew along until the fog ceiling became too low and we were forced above it and inland. Seal colony on the Namibian coastline, south of Walvis Bay. This legendary fog and hard-to-see rocks have caused so many shipwrecks along the Namibian shoreline that the area is referred to as the Skeleton Coast, in part a reference to the hundreds of rusting carcasses of large ships found scattered along the beach. Whale and seal bones once littered the shore as well, a result of the whaling industry in the area. Flying along with nothing to look at but fog made me more than a little nervous, as our tiny plane was not exactly equipped with the most sophisticated navigational equipment. I hoped our pilot had not skipped the lesson on how to use a compass! Of course, I needn’t have worried. Although disturbingly young, our pilot was quite skilled and familiar with the area. 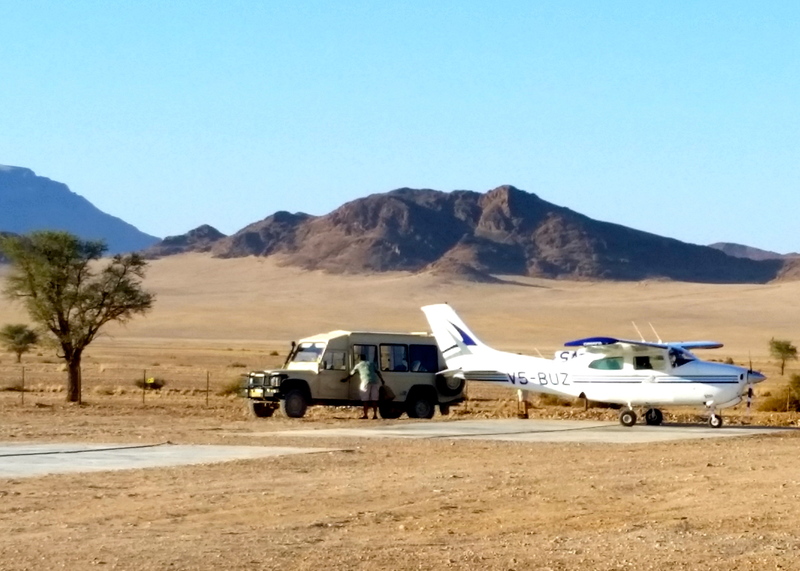 He made a perfect landing at the small Walvis Bay airport, and I finally took a full breath. We said goodbye to our British friends and collected our rental car, a four-wheel-drive truck. The next challenge facing us was finding our hotel for the night, a remote lighthouse located at the end of a ten mile stretch of deep sand. The directions we had been given were vague at best, but more alarming was the suggestion that we let out two-thirds of the air in our tires to avoid getting stuck!